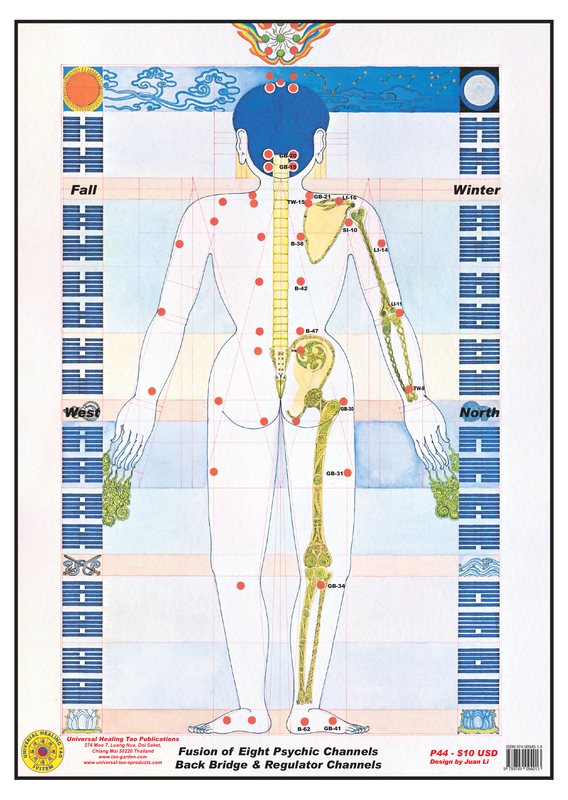 This poster illustrates the Back Bridge and Regulatory Channel with the Points, Directions and Seasons, beautifully illustrated by Universal Healing Tao Senior Instructor Juan Li's original meditative art drawings. The Eight Psychic Channels start opening up the meridians lines of the body with Yang and Yin Sides of the Regulator and Bridge Channels then opening up the spine front to back, up and down and right to left with Spinal Cord Cutting, Microcosmic and Aura formulas. Once these formulas are completed you move to open up the Crown, Five Senses & Heart with drilling and cutting techniques then sealing any energy leaks and protecting the body with the Final Fusion Formula, Sealing the Aura.